I've searched for clues on this but nothing quite seems to make sense. 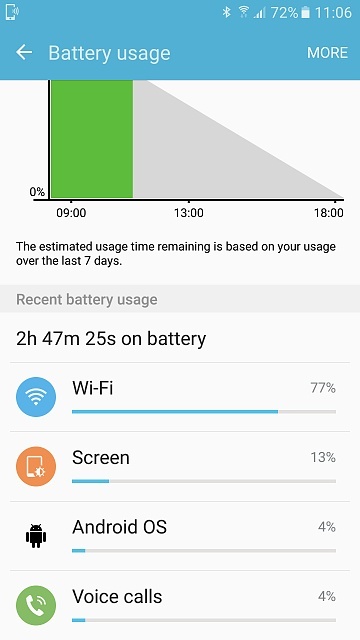 Yesterday my phone was losing its charge very quickly and a look at the battery monitor showed it to be mostly due to wifi. I was connected to my home wifi most of yesterday so I can't think why it would have been doing this. I did a reboot and it seems better today but it's still showing as the top consumer of the battery's power. Is this normal? I suppose 70% of not much isn't anything to worry about (as the battery life seems ok today) but still looks a bit odd and I'm surprised to see the wifi as the most power hungry feature. The WiFi that high is most definitely not normal. You weren't tethering or anything like that, were you? That can be quite a drain. I don't have my wife's S7E handy, but is there a means to see what kind of WiFi data usage shows during that period? There's only so many reasons your WiFi will peg that high... either you are connected to an extremely poor signal and its punching up the gain on the amplifier to try to maintain it, or you're downloading/uploading a ton of stuff. Thanks - nope, not tethering or using it as a hotspot and for most of the time it was either in the same room as my router (which easily reaches all points of my house) or out in the open countryside with no wifi at all. Now, I didn't turn the wifi off at such times, but I never have really with any of my phones and I've never seen such a high battery drain. It was also pretty warm most of the day. I wasn't browsing with it. Today seems better but I just worry in case I've done something wrong. Why have all my apps been replaced by the green android robot? Is my text history being recorded in my google activity history log?